Although the 21st century has made it seem like ambitious women often end up alone, Dr. Sonya Rhodes assures us that this message is completely false. 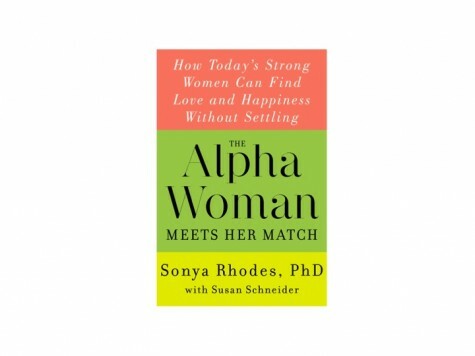 In her new book The Alpha Woman Meets Her Match: How Today’s Strong Women Can Find Love and Happiness Without Settling, the relationship therapist argues successful, modern, career-driven women can meet The One without changing — and she shows them how. Rhodes advises women to look past the overly competitive, domineering alpha male and instead find a man who’s in touch with his inner beta qualities — someone who is communicative, responsible, thoughtful, and collaborative. Demonstrating that most people are a combination of both sets of qualities, she includes a revealing test to help readers define where they (and their partners) are on the spectrum. First of all, what inspired you to write about this concept? I was finding more and more of my clients were identifying themselves as alpha women. Most had devoted their twenties to their education and careers, and they now wanted to shift their focus to dating and finding a life partner. They were very daunted by the messages in the media, saying that it was too late for them and that they should’ve married sooner, and they panicked. This idea is actually nonsense though. When I started doing research to help them, it turns out that women are getting married between the ages of 30-45 now more than ever before. They haven’t missed the boat! And furthermore, even better news, you decrease your chance of getting divorce for every year you delay marriage. Another aspect that inspired me to write this book was identifying one of the main problems my female clients were having: They were going for the alpha male. They thought the macho, traditional, breadwinning guys were the right matches for them. But that’s not the case, because these strong women need a partner, not a boss. So you encourage your clients and readers to look for a beta man. Can you describe the beta man and tell us why his qualities are important for an Alpha woman? The beta man is accommodating, not compliant. He is assertive but not confrontational. He has a strong work ethic, but he’s not a workaholic. While alpha men are often threatened by strong women, beta men aren’t. Their egos are strong enough that they can support ambitious women, which is why I’ve began to refer to the beta man as the “new catch” for the alpha woman. The term “act like a lady” is so retro because what it means to be feminine today has changed. In 97 percent of the cities in America, single, college-educated women under the age of 30 are making more money than men. This is not only a startling and inspiring statistic for women, but it shows that the feminine role is no longer a narrow, scripted identity. Similarly for men today, they’re becoming just as comfortable changing diapers as women. So the whole gender role dynamic has changed; no one has to fit into a box anymore. When it comes to how to act in a relationship, don’t hide who you are. There’s nothing wrong with showing that you’re a strong woman. The guys who are scared off or intimidated by successful women are not the guys for you. Of course, there’s a point where you can become a negative alpha, which I talk about in the book as well, where you’re too bossy and domineering…but this behavior is not desirable in women or men. Your book includes a quiz that allows readers to determine what level of alpha or beta they are. Why did you feel it was important to include that in the book? I developed the gender neutral continuum quiz to help you find out what ratio of alpha and beta you are because everybody is a mix of alpha and beta characteristics. There are two major purposes for this graph: First, it informs you of what your personality traits are and helps you improve yourself. If you rank as a very high alpha, you can develop your beta more. It gives you the tools to help you grow. Second, it helps you choose a partner who is a good fit for you. If you’re very alpha, you want a partner that balances you out by being more beta. We often think of alpha women as the ones that have that have the corner office and successful career. Can you still be an alpha woman if you choose to not be the breadwinner of your family? Absolutely. These women are all over, whether working in an office, organizing the PTA meetings, heading up volunteer work, or running their families. The alpha title is not limited to career women but to strong, confident women who stand up for what they believe. To learn more about strong women finding love, purchase The Alpha Woman Meets Her Match. To get more advice from Dr. Rhodes, check out her new Huffington Post Blog, www.huffingtonpost.com/dr-sonya-rhodes/.